Anyways, this ties in with Vegas, I swear. So if I were to visit one of the beautiful Las Vegas Hotels my obvious choice would be the lavish Paris Las Vegas resort. What I wanted the outfits to exude was the essence of Parisian fashion. So I went classic, simple and elegant with very minimal accessories. Mon Ami Gabi is a restaurant found right in the heart of the Vegas Strip. The theme of the restaurant is French bistro in the 1950s and ’60s and it’s the best place to go if you want the Parisian dining experience without travelling across the world. One of the most popular feature of Mon Ami Gabi is its patio. My vision for the outfit was modern vintage with a Parisian twist. I chose the full midi skirt to reference the full skirts of the ’50s. 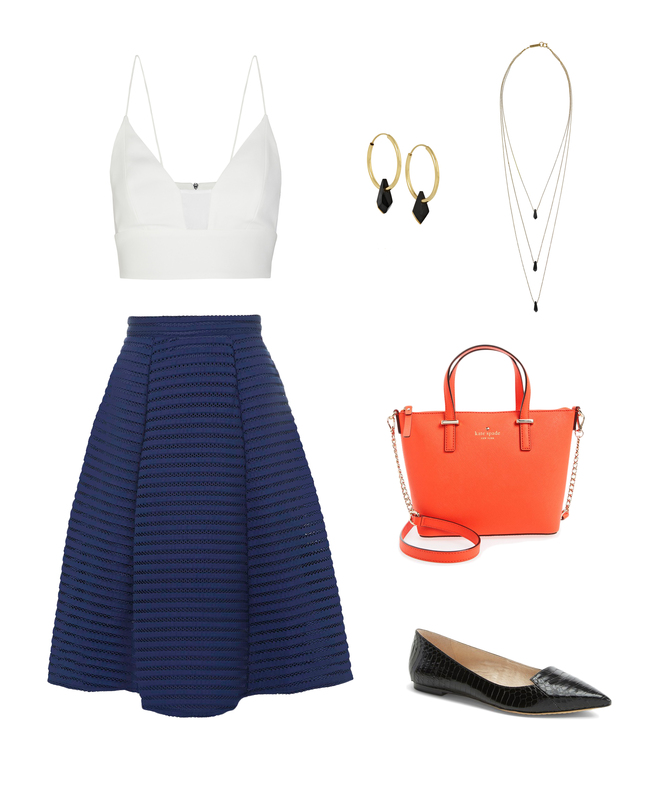 I paired it with a simple white crop top to make it more modern, as crop tops are super trendy right now. I kept the accessories minimal and not too fancy. Parisian women (as well as I) love flats so I paired the outfit with classic pointed flats and topped it off with a pop of colour (via the Kate Spade bag) to add some interest to the outfit. Of course you can’t stay in the Paris Las Vegas resort without dining in the Eiffel Tower restaurant! The restaurant hovers over the Strip, so you can see all of Las Vegas through the restaurant’s floor-to-ceiling windows. The atmosphere is classy and so is the attire. For dinner reservations, the dress code is business attire, which means no jeans and t-shirt. My inspiration for this outfit was none other than the queen of class herself, Ms. Audrey Hepburn, more specifically her role as Holly Golightly in Breakfast at Tiffany’s. I chose to go with the timeless little black dress, except I chose a fit and flare silhouette, which is more my style than a sheath dress. I went with a layered pearl necklace to mimic the pearl necklace worn by Audrey Hepburn in the movie and complimented the necklace with a pair of pearl earrings. I added pointed toe black pumps and topped off the outfit with a vintage Chanel bag — I mean, what’s more French and classic than a Chanel bag? Of course it’s super expensive so I added a link to a more affordable look-alike option. When I think of Vegas, the first things that come up are casinos and nightclubs. So it’s no surprise that Paris Las Vegas has a nightclub. The Chateau has three rooms: the nightclub, the Rooftop Garden and The Terrace. All are decorated in a way that exudes Paris and France. The whole location screams glamour and elegance, with the dress code being upscale nightlife attire. My idea of upscale nightlife was a classic cocktail dress. The dress I chose is a body hugging, glittery party dress with a high neckline and open back. Super tight and revealing is the opposite of my style, so I chose this dress because it’s still has that body-hugging silhouette but the high neckline balances everything. I paired the dress with a glittery gold clutch to complement the glitter on the dress and because it’s like a mini disco ball! Since there’s already so much sparkle in the outfit, I chose simple earrings and chose not to add a necklace to keep everything simple.